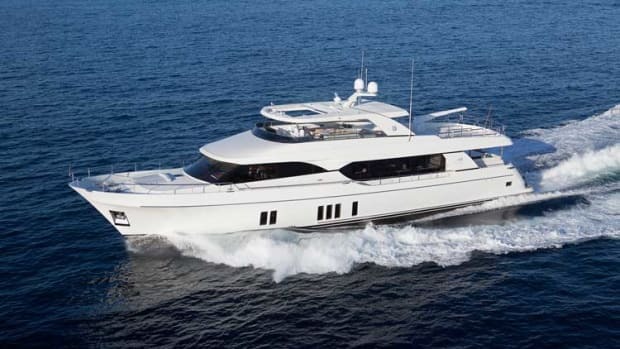 The Ocean Alexander 90r, with design by Evan K. Marshall, takes the builder in a bold new direction. 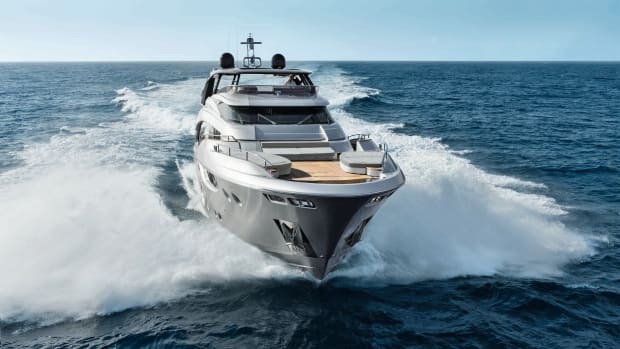 It’s no surprise that the “r” in the Ocean Alexander 90r stands for revolution. What surprises me is that the builder didn’t call it the 90u, as in unexpected. 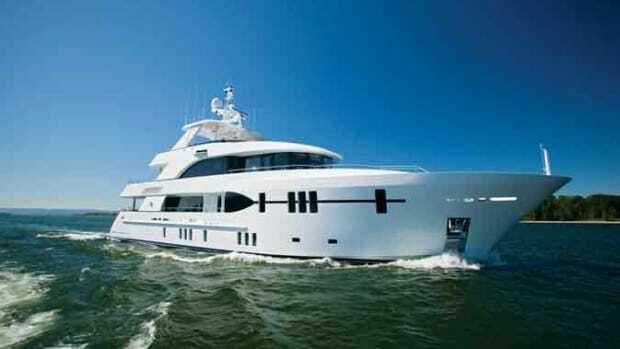 This yacht is unlike any Ocean Alexander I’ve ever seen. Ever. 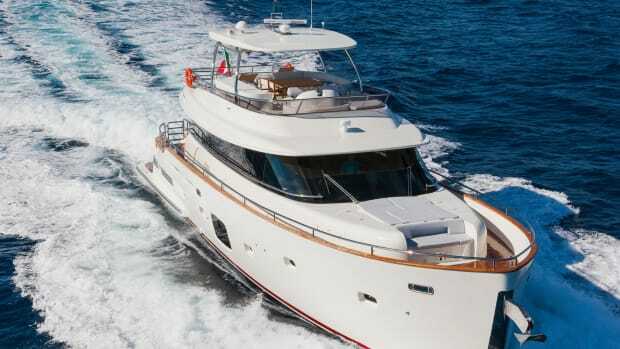 The VIP stateroom benefits from the raised foredeck, with a walk-around berth and comfortable sofa. On that paper, he drew features that Ocean Alexander hopes will redefine what’s possible in a yacht of this size. The beach club has a glass overhead as well as sliding doors to a lounge and wet bar. 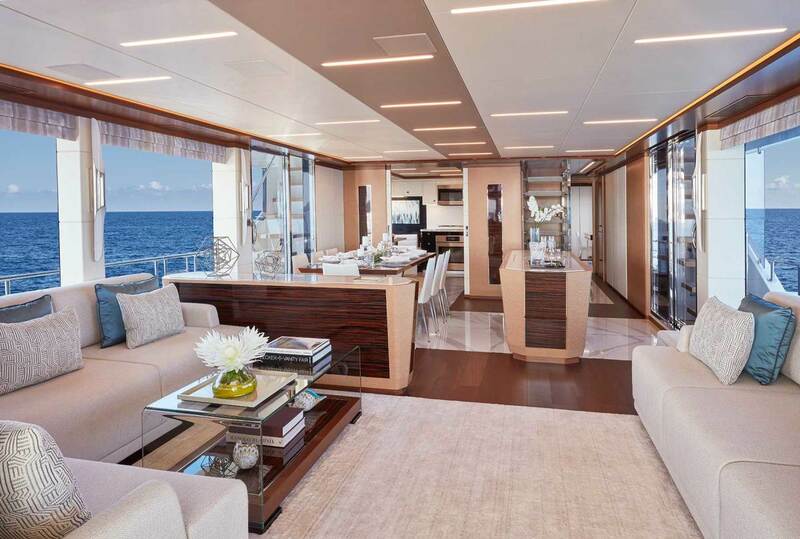 Inside on the main deck, the salon has conventional wraparound couches aft, but the forward dining area has an island wet bar that’s also a buffet counter. The galley, which can be hidden with pocket doors, has a dinette for casual meals. Marshall brought the outdoors into the salon with sole-to-ceiling windows and sliding doors on each side of the formal dining area that mimic the openness of a penthouse. With stainless steel rails outside instead of bulwarks, there is virtually nothing to impinge on the views. The beach club is an airy, glass-topped conservatory on the stern. 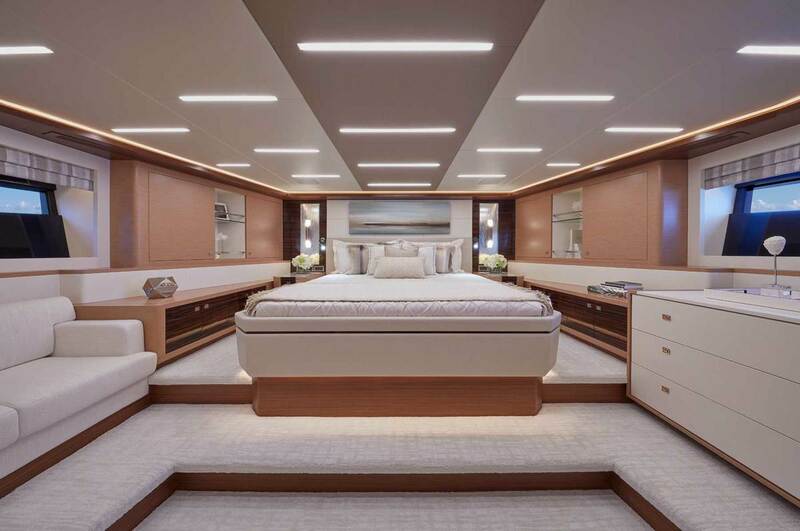 The full-beam owner’s stateroom really spans the beam, thanks to the absence of side decks forward. Its two bathroom compartments, separated by a frosted glass shower, have heated stone soles. There’s also a pair of cedar-lined, walk-in closets. 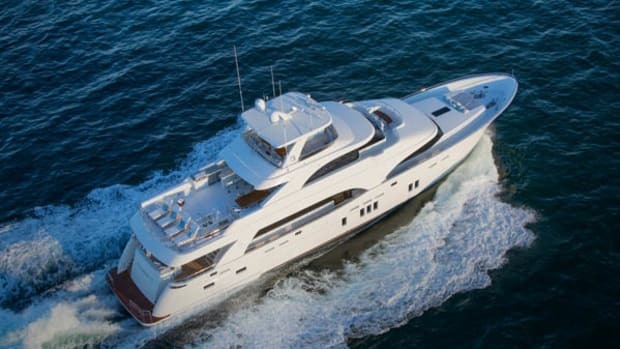 Ocean Alexander offers several layouts on the lower deck, and one has a VIP stateroom forward with nearly the same amount of space as the owner’s suite. In that layout, there are two additional staterooms abaft the inlaid marble foyer, each with twin berths that convert to queens. Another layout choice is a second full-beam owner’s stateroom aft, while a third layout includes four staterooms. Crew quarters are aft with a galley and dinette. The salon is bright with oversized windows and a forward wet bar/buffet. 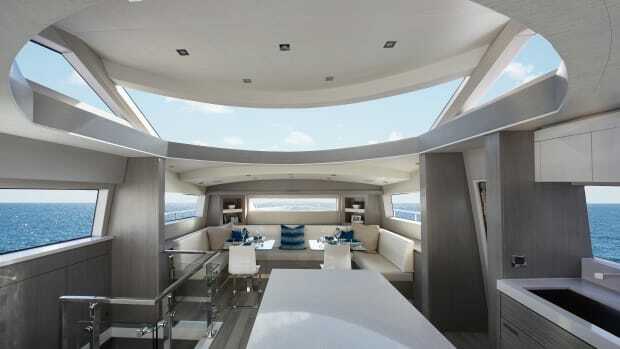 The favorite living area on the 90r will likely be the bridge deck, which can be open or enclosed as a sky lounge. (Open versions have an enclosed pilothouse.) At the helm are twin pedestal chairs with controls in the armrests. 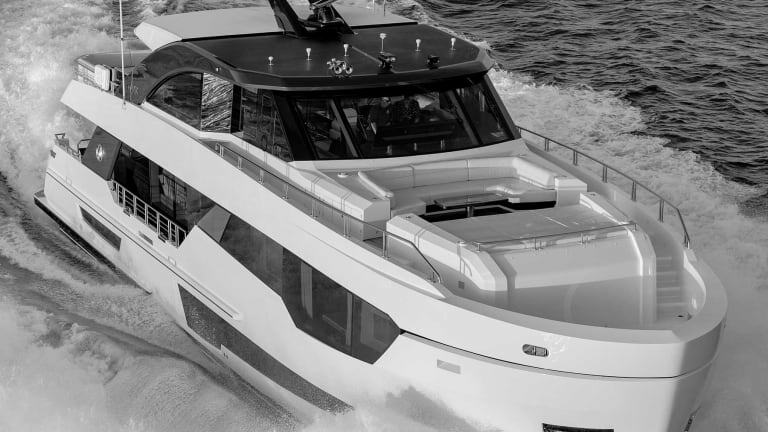 Garmin electronics on triple 24-inch, touch-screen monitors and a Maretron N2KView system—with an iPad walk-around tablet—in an all-glass dash let skippers monitor everything from the engines to the Octoplex electrical system to outside doors. There’s also a desk and chart table just to port of the helm. 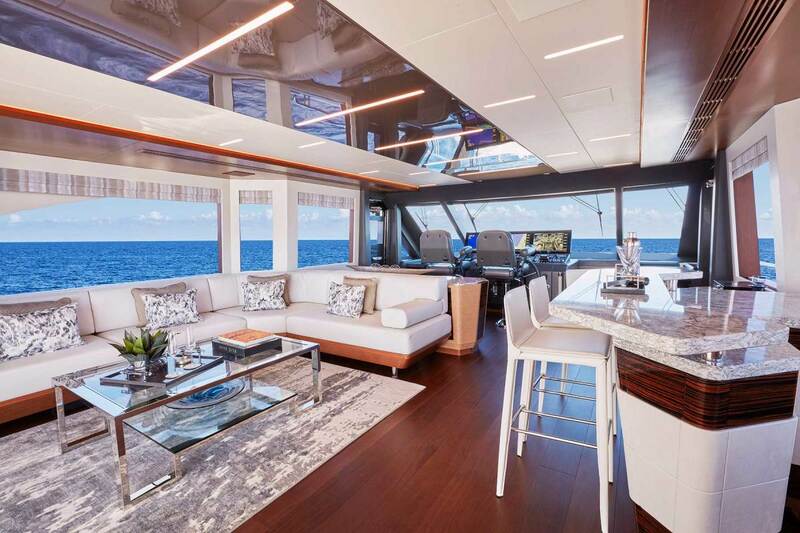 For guests in the enclosed bridge, a wraparound settee faces an L-shaped, two-level wet bar with four stools, and electric sliding doors open to the boat deck. Another bar and two settees with tables are in the after corners. Because the bridge and, hence, the boat deck are on a single level, two pantograph doors from the pilothouse lead to the side decks. 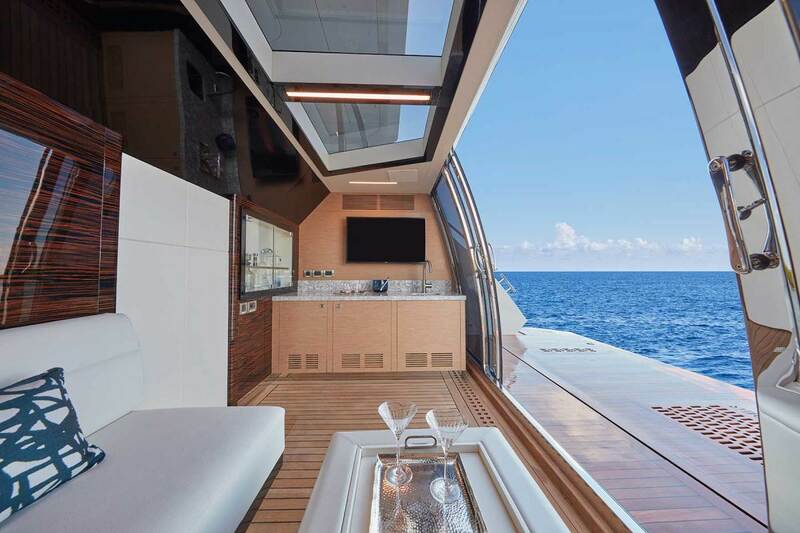 The foredeck has a settee, built-in table and sunpad that converts to a rear-facing couch for dining. Marshall’s interior décor includes custom walnut soles and bulkheads of satin-finished light oak with inlaid accents of stainless steel and ebony. The attention to detail is evident, from the wall sconces to the European hardware on the stateroom doors. The sky lounge will likely be a popular living area, with wraparound seating and a two-level bar. 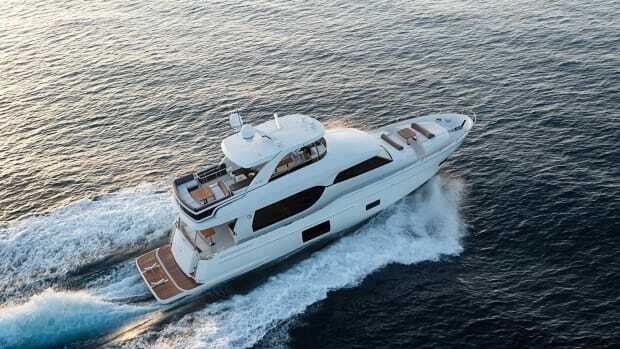 Standard power is a pair 1,600-horsepower MTUs (with an available upgrade to 1,920-horsepower MTUs) and twin 55-kilowatt Kohler gensets, all tucked into a seamanlike and accessible engine room. 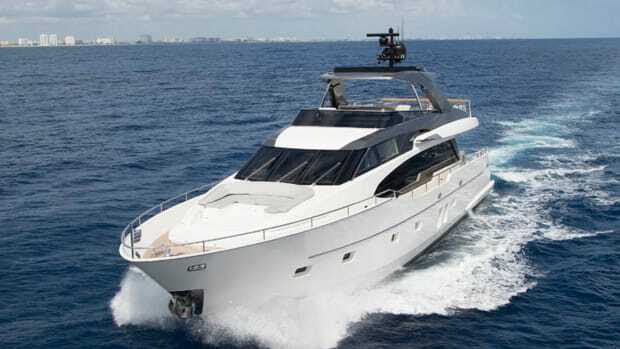 Other standard equipment includes Side-Power bow and stern thrusters and zero-speed stabilizers, a 1,400-gallon-per-day Sea Recovery watermaker, an Atlas power converter with Iso-Boost dual shore power, a hydraulic swim platform, a Crestron audiovisual package, and onboard intranet. Ocean Alexander also adds bed linens, china and flatware, and galley equipment including chef’s knives. After poking through the corners of the Ocean Alexander 90r, I decided that revolution was the right description. 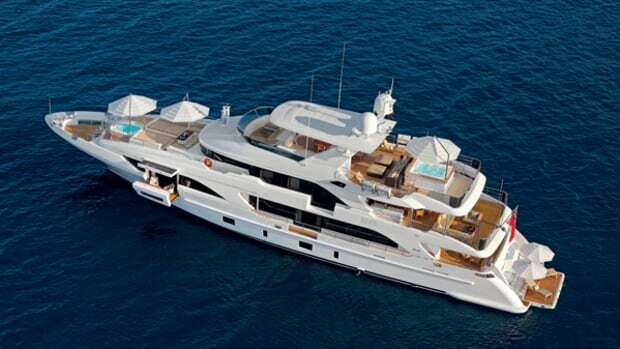 This yacht is a game changer in every respect.